The Leicester Peregrine Project is a run by the Leicestershire and Rutland Ornithological Society (LROS) with the help of Leicester City Council (LCC) and Leicester Cathedral. 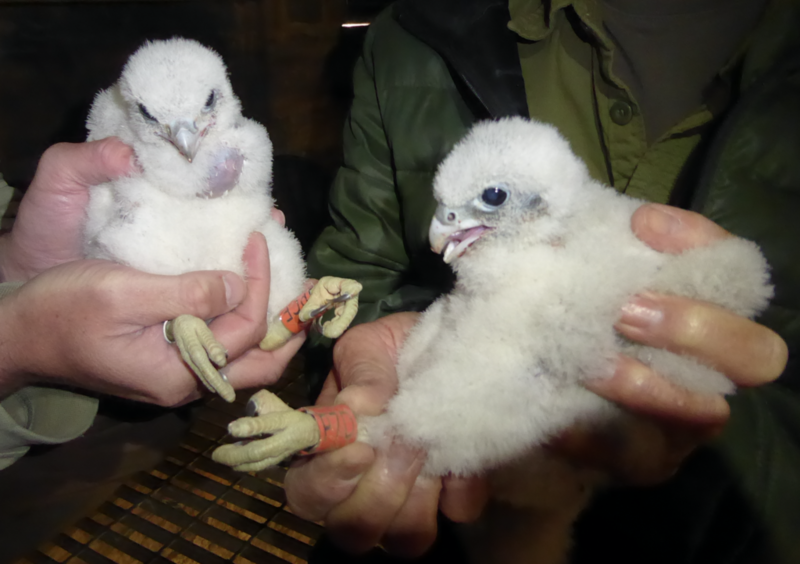 The objective is to Identify, Monitor and Promote the Conservation of Peregrines within Leicester and its environs. 11 April 2019: the pair are still incubating the 5 eggs, even though the male does struggle at times as he is so much smaller than the female. ﻿11 April – Video: the male takes over incubation from the female but struggles to get all the eggs covered fully. 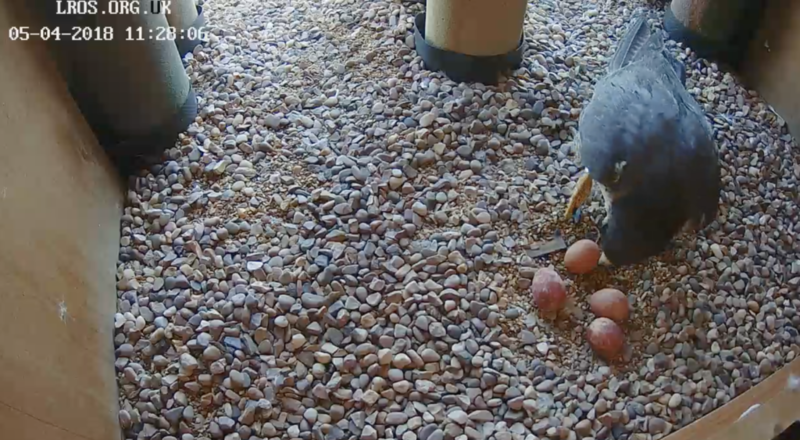 31 March 2019: a 5th egg was laid at 12 noon. This is the first time that 5 eggs have been seen in the nest of this pair since observations began in 2014. 28 March 2019: just before 6pm, the female laid the 4th egg in this year’s clutch. Being 7 days earlier than in 2018, will they go for a 5th? 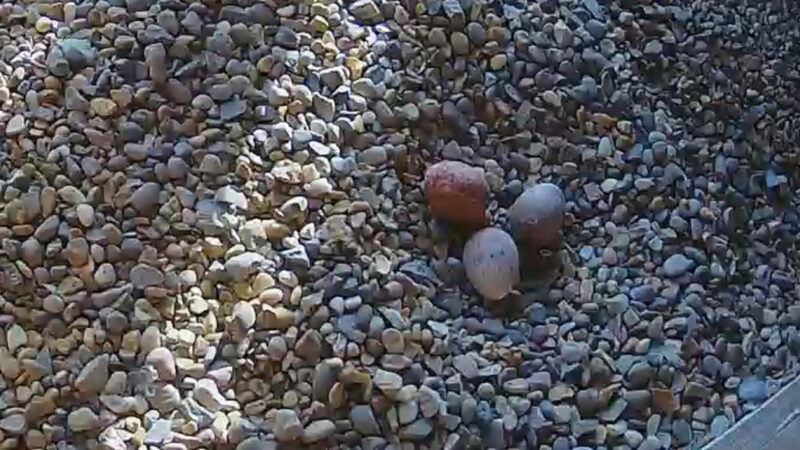 26 March 2019: right on time, the third egg was laid in the early hours of the morning. Further details on the Commentary page later. 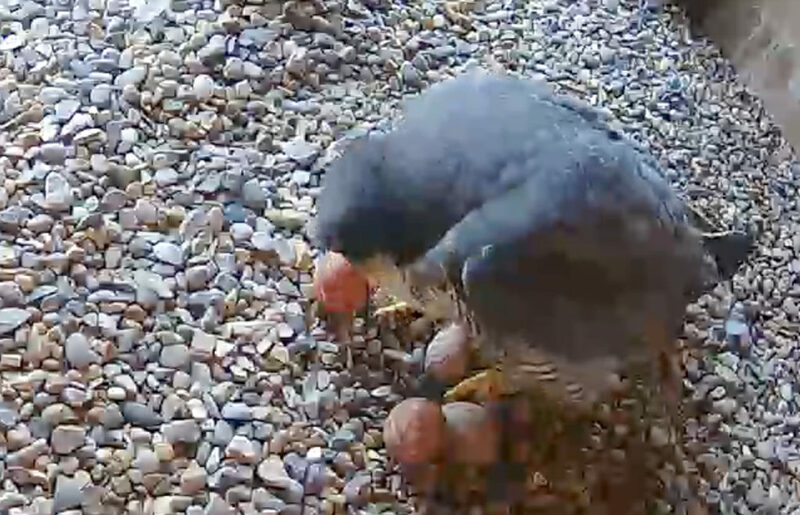 26 March – Video: the female lays her 3rd egg in the early hours. This is extremely dark, we are watching via Infra-Red cameras. 26 March – Photo: right on time, the third egg arrived in the early hours. 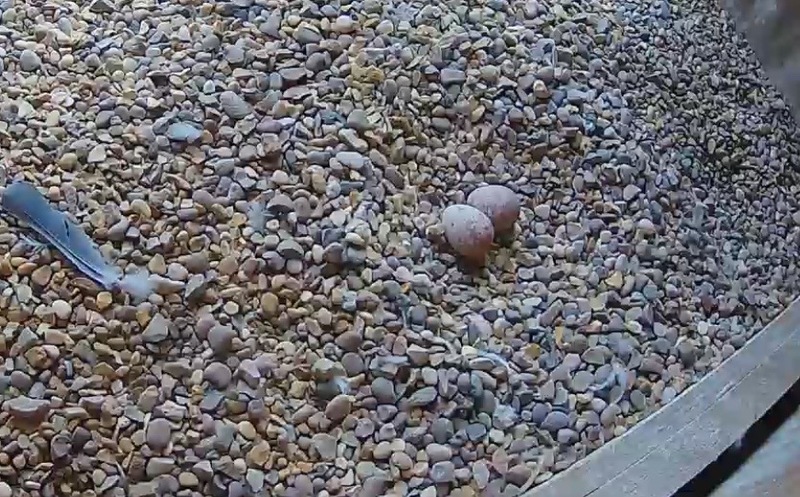 23 March 2019: the second egg of the year arrived at 7:35, right on time as expected. 20 March 2019: We have our first egg of the season. What a way to herald the first day of spring. 20 March – Photo – The First Egg: the first egg arrived at just before 9:00. 15 March: As there is a lot of nest activity currently, we have opened up both cameras, albeit at a lower resolution than we would like. Hopefully this will be rectified by the end of March. 1 March 2019: The Overview camera is now up and running with reasonably stable pictures although we still have some Broadband width issues. 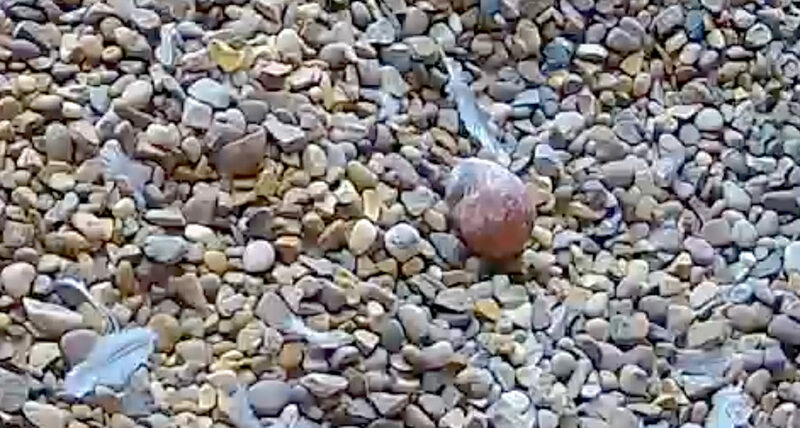 This should be resolved reasonably soon and the other cameras will then come online – hopefully before the eggs are laid. 12 February: Thanks to James Burman and Ken Robinson who have sent me photographs of a juvenile bird on the church at Market Harborough. The partial ring-read seems to indicate this is P7D from 2018. The first confirmed sighting since leaving the Cathedral area in August. 4 February 2019: Two new cameras have been installed, one to replace the faulty unit. Please bear with us whilst we configure them for optimum streaming. 7 January 2019: The long-staying juvenile (PCF) has not been seen on the platform since 11 December. To see a log of current events and activities please visit the Daily Commentary Page or for older information please the Archive Page. 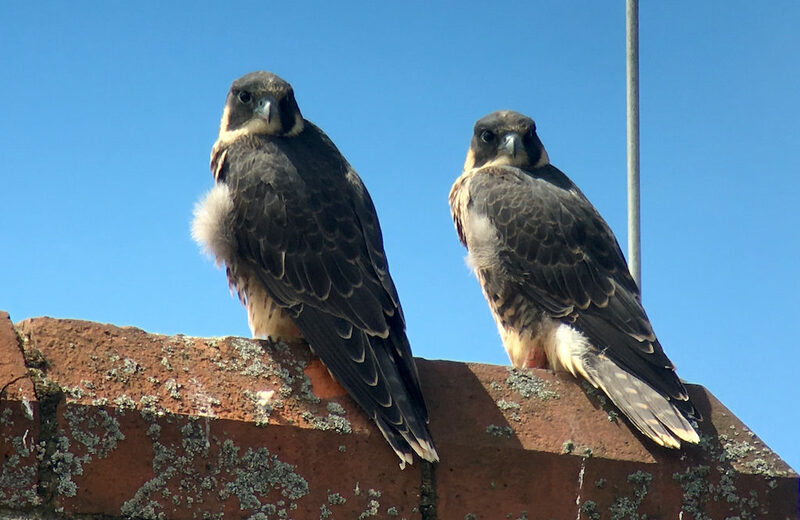 In February 2014, a collaboration between the Leicestershire & Rutland ornithological Society (LROS) and LCC was formed called Leicester Peregrines to monitor the habits and activities of a known pair of Peregrine Falcons in Leicester city centre. A group of volunteers from LROS started surveying the city and noticed the birds frequenting a number of tall buildings. These included Leicester Cathedral, the Old Lewis’s Tower, the Cardinal Building (BT Tower) and St Georges (Blue) Tower. It quickly became apparent that the Leicester Peregrines were intent on breeding. Unfortunately, the location of the nest was less than secure and the decision was made to erect a number of artificial nest boxes on various buildings to try and encourage the birds to move to a safer location. With the agreement of Leicester Cathedral and after the input of an independent Urban Peregrine expert, a 5-star nest platform was erected on the east facing side of the Cathedral spire in March 2016. Unfortunately, this was slightly too late for that breeding season but when the juveniles fledged later that year, the adults immediately brought them to the Cathedral. 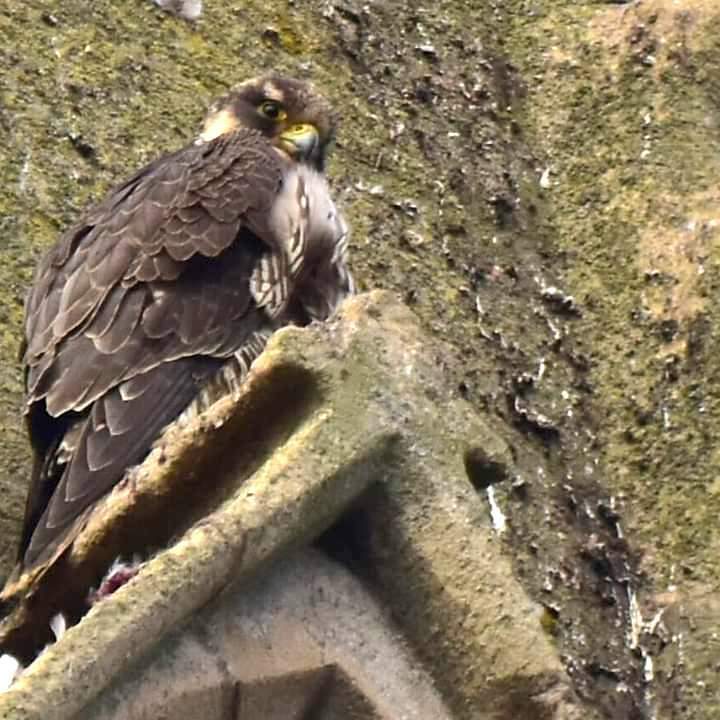 Although the pair did not breed here in 2016, both the adults and the two juveniles could often be seen either on the platform or on one of the spire crosses. This gave us hope that they would return in 2017. And so it proved: they never left the Cathedral and could be seen almost every day either on the platform or on one of the Spire crosses. 14 January 2017 – Photo: the male (left) and female on the platform. In March 2017, the female laid 3 or possibly 4 eggs (the cameras were playing up) only for them all to fail. A few weeks later a second clutch of four was laid but unfortunately these too failed. 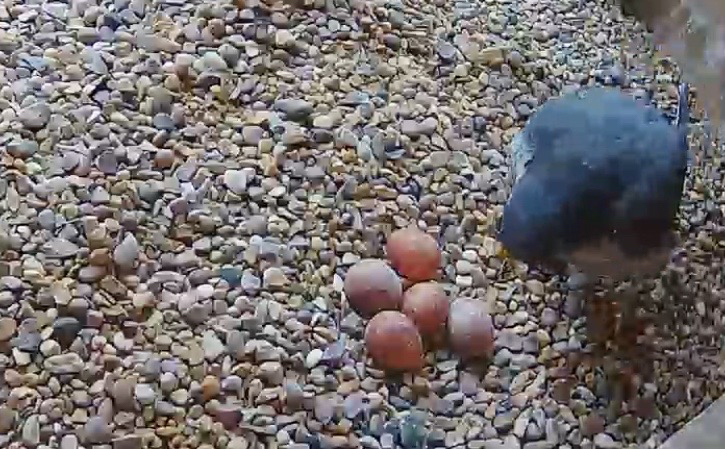 Video footage showed the female eat the eggs when she realised they were not viable. The reason for the failure was unknown but not uncommon in Peregrine falcons. 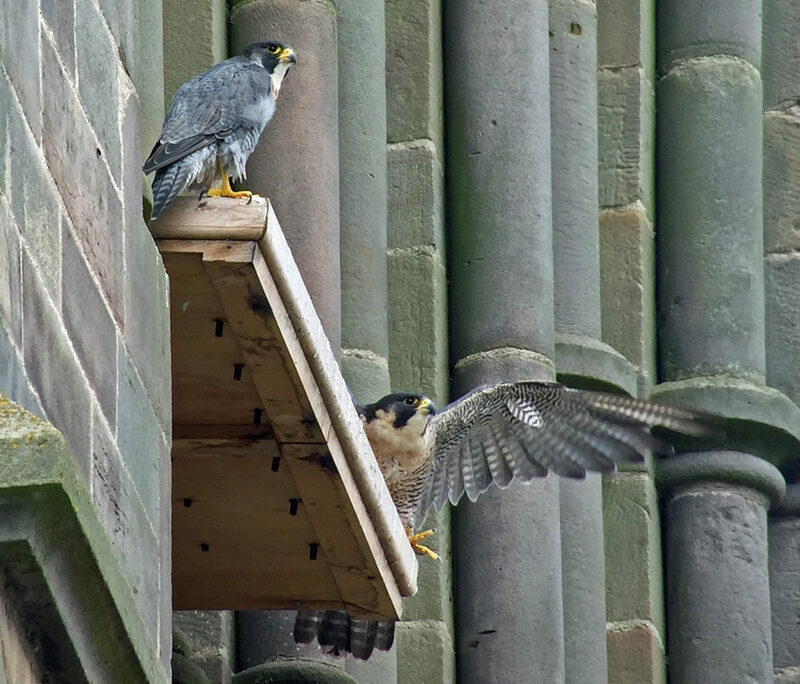 Despite this setback, the pair remained around the Cathedral defending the nest site for the remainder of the season and through into 2018. In 2018, we were hopeful that they would attempt to breed again and all signs were positive. The first egg was laid on 23 March and the clutch of four was completed on 5 April. 5 April 2018 – Photo: The clutch of four eggs was complete. On 6 May, just over 40 days later, the first egg hatched at 01:30 in the morning. A few days later a second egg hatched but unfortunately, the two others were not viable. 6 May 2018 – Video: the first chick hatches from the egg. Both chicks were well looked after by their parents and grew steadily. On 24 May, they were large enough to be ringed under licence from the BTO becoming known as P7D and PCF. It was thought that the larger chick P7D was female it’s sibling a male. 24 May 2018 – Photo: the two chicks ringed under licence at the Cathedral. Just three weeks later and P7D had taken flight and fledged the nest. PCF followed the following day. 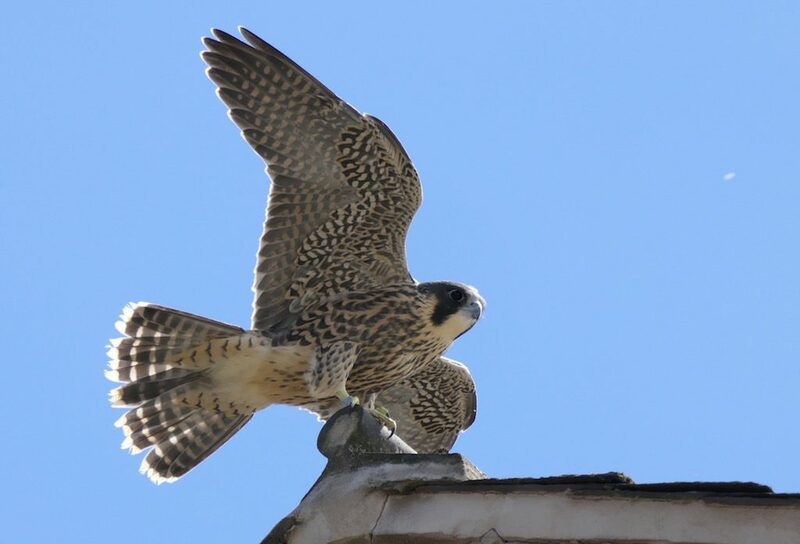 Their first flights were not without concern but thankfully both survived and were frequently seen around St Martins Square and on the Cathedral whilst their parents taught them how to hunt for their own food. 15 June 2018 – Video: juvenile P7D takes it’s first flight – not particularly elegant. Juvenile P7D (always the more adventurous of the two) was the first to leave the area but PCF remained until at least 11 December and could often be heard calling/begging for food. We wish them both well and hope that they may be identified by their rings somewhere in the UK and they manage to set up a breeding territory of their own in a couple of years time.